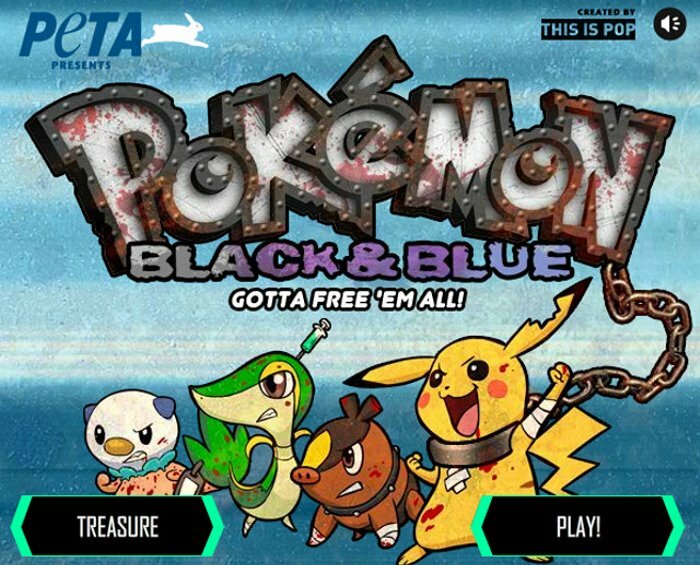 PETA vs. Pokemon: Gee, I Wonder Who'll End Up Black and Blue | OhGizmo! I have nothing against PETA. In fact, I support them for taking such a strong and passionate stand against animal abuse. I know a lot of people disapprove of their shock-value tactics, but hey, they’re free to do whatever they feel works for them. But I think the line has to be drawn somewhere, and I think it has to be drawn here with their new campaign against Pokemon. Apparently, PETA thinks the Pokemon are being held against their will in Unova and they insist that the time these fictional creatures stay locked in their pokebolls is ‘akin to how elephants are chained up in train carts.’ I don’t approve of circuses keeping animals in captivity just to make them perform, but somehow this Pokemon campaign makes me think that PETA is running out of ways to get their message across the right and sensible way. They’ve released a parody game called ‘Pokemon Black and Blue’ to spearhead their campaign, which you can check out and play after the break. My girlfriends a Vet and I participate in many anti-animal abuse functions though the year and I still don’t agree with Peta. They “save” 86% of the animals they take in via euthanasia, then have the audacity to attack others that do the same.